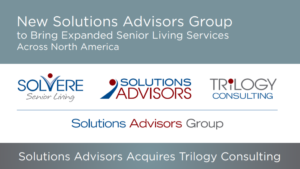 To better serve a growing and diversifying senior living market, Solutions Advisors, based in Princeton, New Jersey, has acquired Trilogy Consulting, LLC. Scott Townsley, the founder of Trilogy, has more than 30 years of experience in senior living and will serve as Principal of Trilogy. He previously was the Managing Principal of Third Age, Inc., a nationwide firm dedicated to consulting and strategy for senior living organizations. More recently he was Principal within the senior living practice of CliftonLarsonAllen, LLP. Tim Ficker joins Townsley as Trilogy Managing Principal. Ficker brings more than 20 years of experience in executive coaching, executive search and leadership development in the senior living field. He formerly was the Managing Director of MHS Consulting and has provided leadership to some of the country’s most progressive and successful senior living firms, including Erickson Communities as Vice President of Organization Development and Senior Director of Operations, as Chief Operating Officer of Shell Point Retirement Community and Executive Director of Cypress Cove Retirement Community. Ficker also founded consulting and coaching firm, TDF Resources, Inc.
Trilogy provides a dynamic range of consulting services including strategic planning; primary and secondary market research; affiliations and mergers; succession planning; governance and leadership development; executive search; and master planning, among other services. With offices in Princeton, New Jersey, Richmond, Virginia, and a new office opening this spring in St. Petersburg, Florida, the Solutions Advisors Group will serve a broad mix of customers with the full range of senior living services and products to an expanding client base across North America. “In becoming part of the Solutions Advisors Group, we look forward to creating a senior living powerhouse of consulting, strategy, leadership, marketing, branding, affiliations/mergers and management expertise,” Townsley said.